← My Script Has Been Rent Asunder at The Proving Grounds! 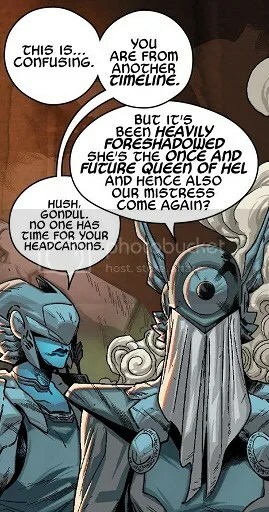 The first story arc of Angela: Queen of Hel comes to a close, and I’m ready to move on. This has been a fine series, but I definitely felt hampered that I didn’t read all of the first Angela comic. The ending promises a fresh start with the next issue, though! 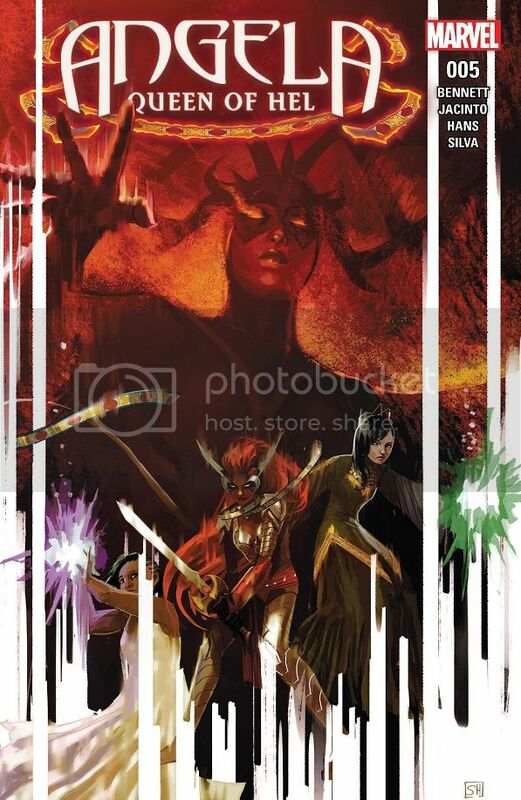 Angela and Sera face off against Hela for control of Hel. They have to deal with wraiths and a hellhound or two, but Angela eventually gets the upper hand and strikes the crown off Hela’s head. Sera puts it on her beloved, and Angela rules! Her first order of business is to free all of the angels from Hell, then she frees Leah, and brings Sera back to life. The two share a lovely kiss, then Angela immediately renounces the throne and passes leadership of Hel off to Balder, who promises to uphold Angela’s decrees. Angela and Sera then retreat to the real world to start a nice, cozy life in New York. I gotta be honest, I was a little lost in the beginning of this issue. It all comes together in the end, with a very strong finish, but I think Bennett had two many different forces in play. There were angel slaves, and wraiths, and something else, and the snappy dialogue was, I think, purposefully misleading. I don’t know, it was just really hard to follow exactly what was going on. But once we actually got to the face-off, everything came together. I think Hans is the artist responsible for the splash pages, and they were great. Very dramatic, very cool. And the fight with Hela, and especially the victory, are all quite strong. Angela and Sera are very fun together, and I look forward to a story where it’s just the two of them, without all this madness and confusion. I would love an issue of Angela and Sera navigating the Brooklyn IKEA. This new issue is noteworthy for the arrival of the new Giant-Man, a rather subtle attempt by Marvel to inject some diversity in their superhero lineup (by subtle, I mean making him a supporting character in Astonishing Ant-Man). Being a huge fan of diversity, I’m all in favor of the new Giant-Man, and I’m excited to see him in action. 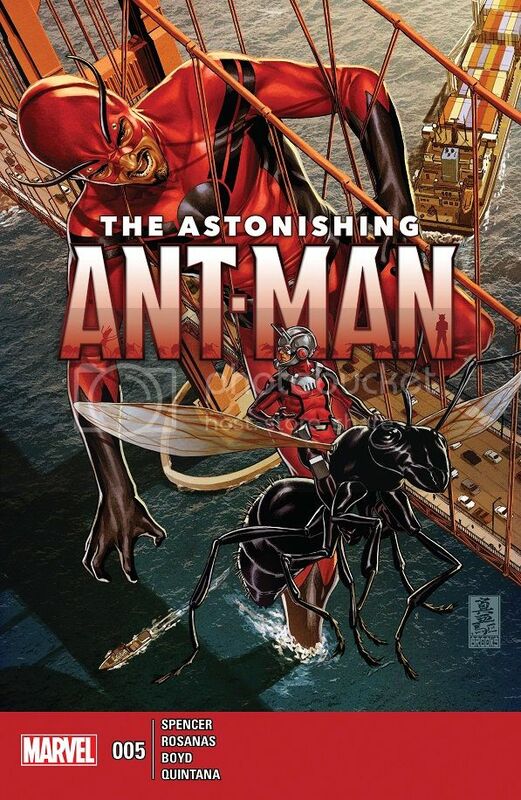 Ant-Man heads to San Francisco to lend a hand to the new Giant-Man after a bit of bungling on the Golden Gate Bridge. Scott met Raz Malhotra in the Ant-Man Annual issue, and passed along the Giant-Man costume, but Raz hasn’t been a very good superhero. The two do a quick montage to hopefully get Raz up to speed. Then they try to sneak into the Power Broker’s new Hench 2.0 presentation, only to get into a fight with the new female Blacklash outside. During the presentation , Power Broker introduces Hench X, a new program that will give super-powers to ordinary people so that they can become super-villains. And later, we see Cassie Lang signing up for Hench X! I definitely liked the arrival of the new Giant-Man in this issue, and I think he has potential. Raz seems like a pretty cool guy, and I like that Ant-Man, who’s already considered something of a screw up, empowers another screw up to be Giant-Man. Neither one of them is Captain America, they’re just a couple of guys trying to pull this off. Spencer already has a great handle on Scott Lang, and he infuses Raz with that same affable humanity. Giant-Man is a nice addition to the cast. This whole Hench/Lackey thing is getting a little complicated, though. I like the general idea (even if it seems a little too big in scope to be contained to just Ant-Man), but Spencer keeps adding layers without fully embracing the concept. Granted, maybe this is how apps work. Your guess is as good as mine as to how this business is run, but at least Spencer makes it seem legit. I totally buy that Power Broker is trying to run a business here, and it’s a nice story. But first there was Hench, then there was Lackey, and now Hench 2.0 and Hench X, and Ant-Man is barely involved in any of it so far. 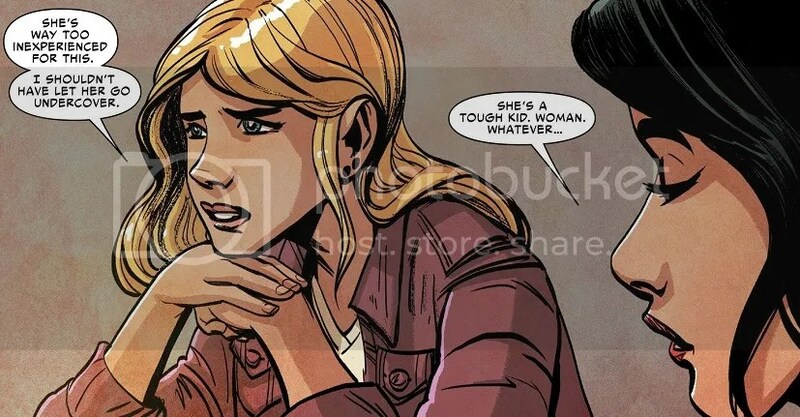 But having Cassie Lang sign up for super-powers should be pretty fantastic. This was not worth the wait. 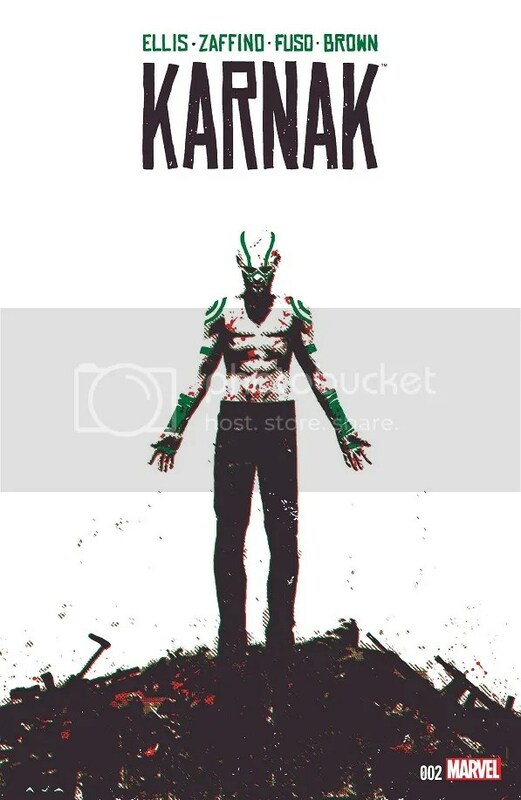 The last issue of Karnak came out in October, and it was very cool. Warren Ellis seemed to bring back the magic of his badass Moon Knight series. But something went wrong, Karnak was delayed forever, and now we’ve got a fill-in artist on a couple pages. So much for Moon Knight II. Karnak invades the I.D.I.C. building to rescue the kidnapped Inhuman boy, and he fights his way through a bunch of henchmen. When he arrives in the main chamber and confronts the leader, the guy tries to talk Karnak into believing that the boy is some kind of Inhuman messiah. Karnak scoffs at the idea, but eventually either agrees to meet the boy or is mind-controlled into doing so. The boy is being kept at another location, which Karnak will have to find for himself. Karnak then kills the leader and goes to get a glass of water from a nearby cafe. The story is also less interesting at this point. I thought the first issue was going to be a stand alone, like Ellis’ Moon Knight series. As such, the rescue of the kidnapped boy just doesn’t seem that enticing. Karnak smashes his way through some nameless henchmen and confronts a nameless leader guy, who has an interesting chi-gun power, but is still quickly and easily defeated. This series feels like it’s built on style, but the style is shaky at best, and already crumbling. Ellis’ Karnak seems really cool, but this quest doesn’t seem like the most fascinating thing Ellis could do with him. Also, I think Ellis says in this issue that Karnak never underwent Terrigenisis, and that his powers are the result of intense training. That is not a good retcon. 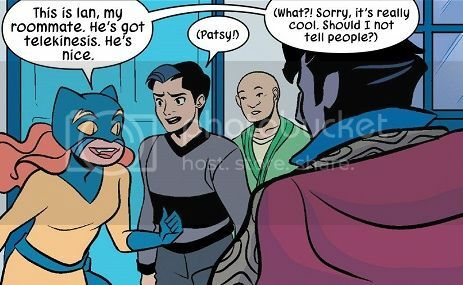 The new Patsy Walker series might be the perfect distillation of the current wave of female heroes (if we don’t count my own comic, of course!). It’s cute, it’s funny, and it’s built on a very strong foundation of human stories. With all introductions and set-up out of the way, Leth and Williams can finally start stretching their legs with ordinary stories now. Patsy’s new landlord is a jerk, and he’s notorious for using dirty tricks to force out any tenants he doesn’t like (though he does have a super handsome son!). Patsy discovers this first hand when she’s attacked by mystical bedbugs at night, but she doesn’t have any proof that the landlord is behind it. So Patsy goes to visit Doctor Strange to get his help, and so that Marvel can get in another Doctor Strange cameo. Strange gives Patsy a magical upgrade to better take on the bedbugs, and she goes back to her apartment to spy on the father and son. Turns out, the landlord really is a creep, and he’s trying to use his son to steal from tenants. The son is the one who controls the magical bedbugs, and he and Hellcat get into an icky insect fight. Patsy wins in the end, and discovers that her arch-villain, Casiolena, was trying to recruit the son into her new super-villain gang. Instead, Patsy uses her new super-powers temp agency to get him a job as an exterminator! This issue was a really good combination of all the things that Hellcat brings to the table. We’ve got a nice done-in-one super-villain encounter, as Hellcat battles a villain who can control bed bugs. That’s pretty original. We’ve got a good use of Patsy’s personal life stuff, since the basis for the battle is a dispute with her landlord, and she brings her roommate along to meet Doctor Strange (whom Patsy calls ‘Steve’). 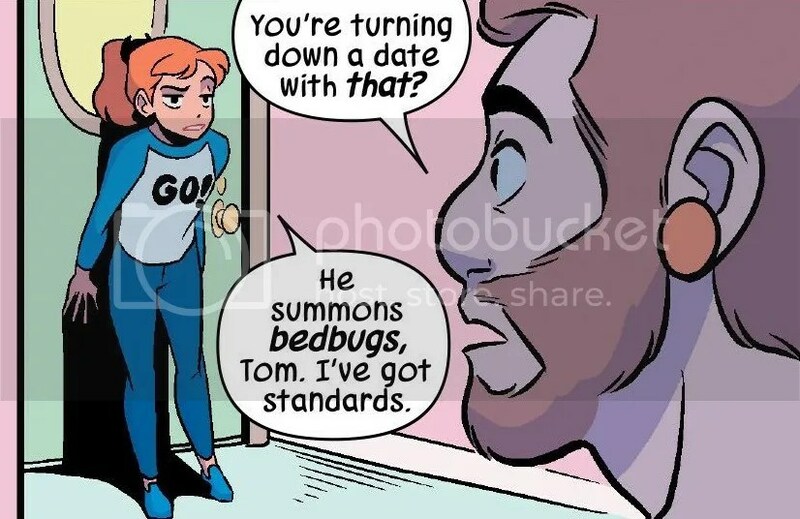 Plus there’s the momentary flirtation between Patsy and the handsome son, which ends with her turning him down for a date because his super-power is bed bugs. It’s all very fun and personable. He could be the next Maggott! 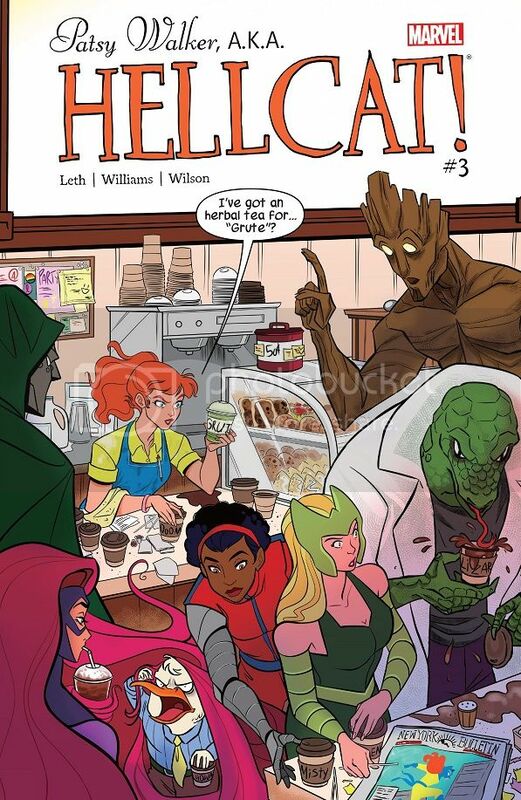 Williams’ art remains delightful, just like Leth’s writing. The characters are all distinct and friendly, and the colors by Megan Wilson are gorgeous. This is just such a well-constructed comic book. I hope it finds its mark and becomes popular enough to stay afloat. 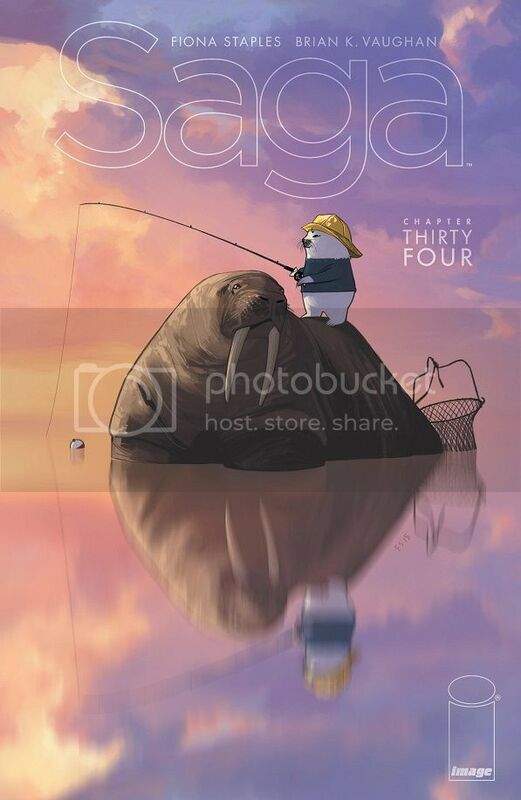 I think Saga has reached the point where single issues no longer matter as much. Don’t get me wrong, the current volume is still pretty strong, and Vaughn is still a master of turning pages and cliffhangers. But the story has become so thick with characters and plots that there’s almost too much to cover in a single issue. Hazel’s transgender prison friend, Petrichor, finds her with her teacher, who took a nasty fall a few issues ago. Petrichor immediately recognizes how special Hazel is, and notes that the teacher is still alive. She quickly begins covering for Hazel to straighten this all out, and soon the teacher is recovering in the hospital, and everything is pretty square. Later, once she’s out, the teacher tells Hazel that she’s going to help the girl escape! Meanwhile, Marko and Alana find Robot IV and his wacky gang, and they kinda, sorta blackmail him into helping them rescue Hazel. Double meanwhile, The Will (whose gotten fat) has the reporters, Upsher and Doff, at his mercy. He’s taking drugs, hallucinating about The Stalk, and is hanging out with his sister’s dog instead of Lying Cat. He threatens the two reporters until they reveal that they might know how to find Robot IV. This issue was fine, and enjoyable in that usual Saga way. The characters are almost all pretty amazing, and watching them interact remains a nice pleasure. I especially enjoyed Hazel’s adventures in this issue, as the young woman grows up before our very eyes. She’s going to become someone truly special. Everyone else kind of ambles along. This was a good read and another fine chapter in this ongoing Saga, but there’s almost too much going on right now, and almost too much left unsaid. This is the kind of issue that suggests we should all be reading Saga via trade paperback. There’s a scene in this issue that makes me wish I was reading a different kind of Silk. Instead, we get the regular kind of Silk, which is still fine. Cindy Moon has been missing for awhile, and her friends and fellow superheroes are worried about her. She’s been turned into a feral goblin by the Goblin King, and he sends her out to kill Black Cat. Silk arrives at the Cat’s penthouse and makes short work of the traitor, Killer Shrike, before Black Cat whips her goblin tuckus. Cat also has an antidote and saves Cindy, then declares that they’re going to take down the Goblin Nation together! The scene I mentioned earlier is only a few panels long, and it involves Mockingbird and Spider-Woman hanging out in a bar worrying about Silk. The rest of the issue does not live up to the promise of that scene, but it holds the potential to be everything I want to see from the character and the comic. Basically, I want to know how Silk fits into the larger Marvel Universe. Hear me out: Silk is a fine character. I enjoy her comic, for the most part, and I definitely like her as a character. She’s fun, funny and very personable. But who is she? To anybody? Silk started out as almost an after-thought in a Dan Slott story, when Marvel needed Spider-Man to have some kind of…Original Sin? That was the name of that crossover, right? Where Marvel would reveal all these big, bad secrets? I think so. And it was revealed that Cindy Moon was bitten by the exact same radioactive spider that bit Peter Parker, and that she spent most of her life in a bunker. But now she’s progressed as a character to the point that people like Mockingbird and Spider-Woman are worried about her. I want to read the stories where the two of them come to care about Cindy that much. I want to know what everybody else thinks about this sudden and mysterious arrival and her connection to their pal Spider-Man’s past. Does she have any other superhero friends? Does anybody care about Silk? It’s apparently forbidden that she spend any time with Spider-Man, so why not some other Marvel heroes? Why not establish Silk’s role in this universe? Right now, Silk is one of three female spider-people getting a big push from Marvel (there’s even a crossover coming up!). She’s not unique or special, and could very easily fade away into nothingness. Comics like All-New Wolverine, Unbeatable Squirrel Girl, Spider-Woman and Patsy Walker a.k.a. 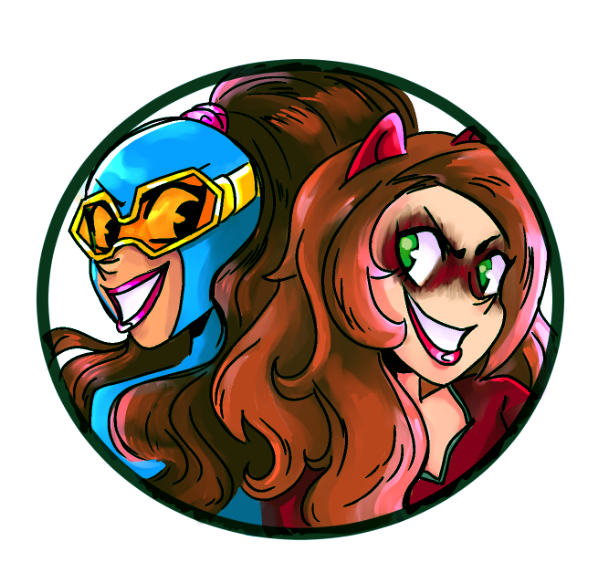 Hellcat are doing the ‘fun female hero’ comic much better than Silk, and all of those characters have a lot of history and staying power behind them. If their comics get cancelled, they’re bound to stick around. There’s nothing anchoring Silk to the MU. But there could be. She’s still a human being living in this world of superheroes. She could have friends, she could have people who worry about her, and there could be very cool and entertaining reasons for that. But we don’t get them in this series. Instead, we get Silk caught in the middle of a relatively pointless feud between Black Cat and the Goblin King. These stakes don’t matter. They barely matter to Silk. Neither the Cat or the Goblin King have any bearing on her life or superhero career, but we’re five issues in, and they’re still the only thing Silk talks about. Thompson and his stellar team of artists have a potentially great comic on their hands. Their main character is a lot of fun, and her connection to Spider-Man could propel her to interesting places in the Marvel Universe. Heck, Thompson already has a couple potentially interesting plots cooked up. But Silk is drowning in all the excess stuff in her comic. It’s great that she has friends who are worried about her, but Cindy has never spent any time with them that we’ve seen. Likewise, she’s barely touched base with Mockingbird, when that relationship could be really entertaining. Silk only ever worries about her missing family, rarely taking steps to actively find them. The Goblin King and Nation are as cliche as they come. And the Black Cat is so completely out of place as a ‘queenpin’ of crime that Silk’s partnership with her rings just as hollow. 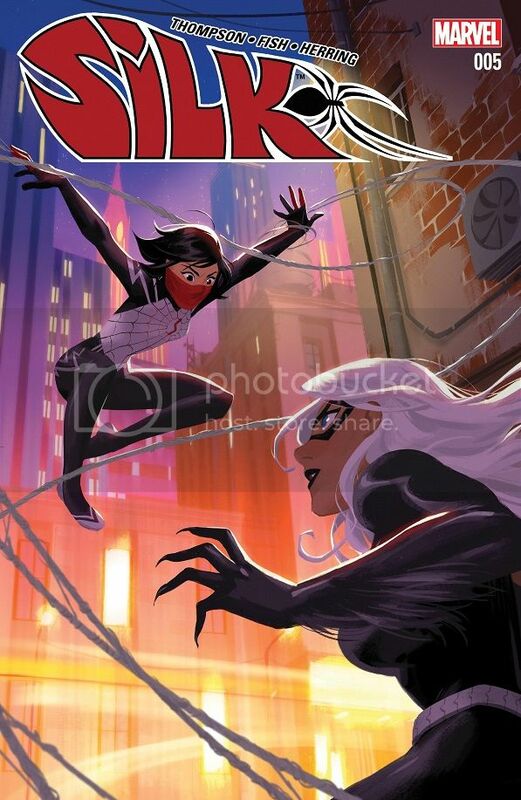 Who cares that Silk is teaming up with the Black Cat when she is no longer the Black Cat we all know and love? Not to mention that J. Jonah Jameson has been dragged down into this mess too. Does he really have nothing else going on in his life than to be equally obsessed with Cindy Moon and Silk, despite not knowing that they’re one and the same? Silk is still a fun comic, and the art is typically spectacular. But Thompson needs to get rid of the chaff so that Cindy Moon has room to breath and grow. I think I see what Bermejo is going for here, I just hope he picks up the pace a little. We’re two issues into the new Jokers story and we’re still in the introduction phase. 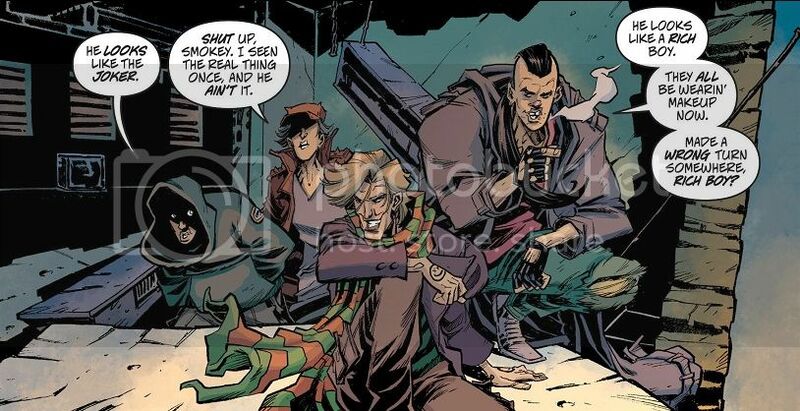 While the various Robins try to get on with their normal lives (some of them having an easier time with it than others), Smiley starts rounding up street thugs to be his new Joker gang. He’s wanted by the police for killing his parents, and now he just wants to go around causing crazy mischief. ‘Cause he’s a Joker. Dre, in his new nondescript vigilante identity, confronts Smiley and his gang while they’re harassing a family in an alley. They argue at gunpoint about the differences between wearing a mask and wearing makeup, before the family’s young boy causes enough of a distraction for everybody to get away. This is building into a powder keg! This might just be me, but I don’t care for this guy Smiley. He just doesn’t seem to have any depth, to either himself or his interest in the Joker. And it doesn’t help that his gang is just a bunch of random street thugs who he bullies into joining up. I feel like Bermejo could great some real mileage out of the idea of a real gang modeling themselves after the Joker. The Clown Prince of Crime is a real presence in Gotham City, surely he inspires somebody? He’s done a great job treating the Robins as a movement, why not do the same for the Jokers? And honestly, the Jokers should have killed that boy or his parents in the alley. If Dre and the family all survive this first encounter, how threatening can the Jokers be? But I like where this story could be going, where I think it’s going. A lot of the Robins are out of commission right now. Duke is still mostly worried about his parents. Dax is working on equipment. Dre is fighting crime under a different mask, etc. So I like the idea that this Jokers gang might get big enough that the Robins have to come back together to stop them. But hopefully we can get there soon, because the Jokers on their own aren’t enough to carry a comic. We need the powder keg to blow soon. 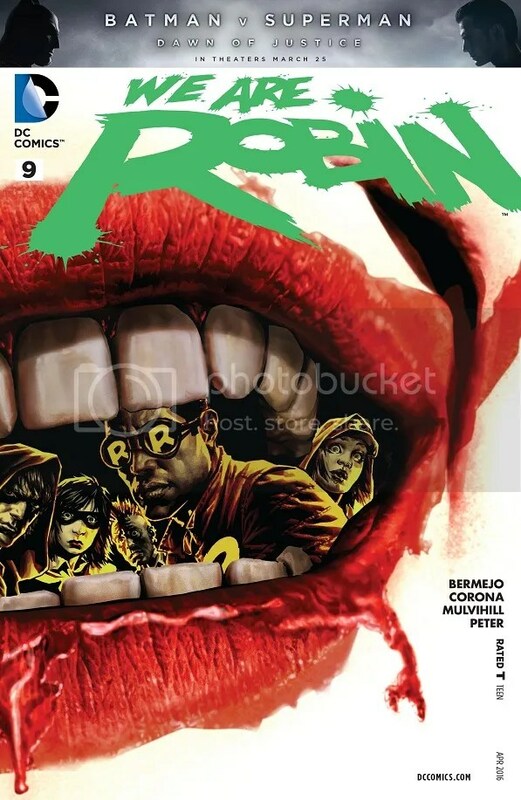 Posted on February 27, 2016, in Comics, DC, Marvel, Reviews, Robin and tagged Angela, Angela: Queen of Hel, Ant-Man, Astonishing Ant-Man, Cindy Moon, Duke Thomas, Giant-Man, Hellcat, Image Comics, Karnak, Patsy Walker, Patsy Walker a.k.a. Hellcat, Saga, Scott Lang, Silk, We Are Robin. Bookmark the permalink. 2 Comments. Angela was amazing. Such a fantastic end to the arc. Great storytelling, great action, and such beautiful romance between Angela and Sera. And, of course, all the Stephanie Hans splash pages are gorgeous. Ant-Man was fun. Nice to see the new Giant-Man showing up. I liked the Lego San Francisco training montage. Karnak was good. Very brutal. I feel like Ellis just went, “I don’t feel like doing a full script. I know! I’ll get Zaffino to do a bunch of pages of Karnak killing people!” Though Ellis is right about Karnak not undergoing Terrigenesis. That was always the case. It’s central to his character. That’s not a retcon, that’s existing canon. Hellcat was great. It’s fun and adorable and wonderful. Silk was pretty good. Black Cat comes across well. Very competent. I stand corrected on Karnak and Terrigenesis! I will admit that I have never read much Inhumans. I wasn’t entirely sure on the LEGO training montage in Ant-Man. I guess it makes total sense that Giant-Man can shrink down to LEGO size too, but I’ve never been a particularly big fan of that shrinking and growing thing. Kind of defeats the purpose of calling themselves Giant-Man and Ant-Man.